The long-hidden story of a family we thought we knew—and of a power-making apparatus that we have barely begun to comprehend. After eight disastrous years, George W. Bush leaves office as one of the most unpopular presidents in American history. Russ Baker asks the question that lingers even as this benighted administration winds down: Who really wanted this man at the helm of the country, and why did his backers promote him despite his obvious liabilities and limitations? 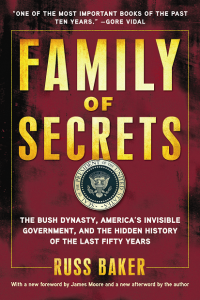 This book goes deep behind the scenes to deliver an arresting new look at George W. Bush, his father George H. W. Bush, their family, and the network of figures in intelligence, the military, finance, and oil who enabled the family’s rise to power. Baker’s exhaustive investigation reveals a remarkable clan whose hermetic secrecy and code of absolute loyalty have concealed a far-reaching role in recent history that transcends the Bush presidencies. Baker offers new insights into lingering mysteries—from the death of John F. Kennedy to Richard Nixon’s downfall in Watergate. Here, too, are insider accounts of the backroom strategizing, and outright deception, that resulted in George W. Bush’s electoral success. Throughout, Baker helps us understand why we have not known these things before. Family of Secrets combines compelling narrative with eye-opening revelations. It offers the untold history of the machinations that have shaped American politics over much of the last century.